Guest conductor Jerry Blackstone, director of choirs and chair of the conducting department at the University of Michigan School of Music, led the Springfield Symphony Orchestra, the Chorus of the Berkshire Choral Festival, and two vocal soloists in compelling performances of music by Lauridsen and Vaughan Williams in the second concert of BCF’s 2013 season. At age 70, Morton Lauridsen may be considered the dean of living American choral composers. A longtime music professor at the University of Southern California, he wrote the 17-minute cycle “Mid-Winter Songs,” setting five poems by Robert Graves, in 1980 for USC’s centennial. The music is more agitated than usual for Lauridsen, from the chilling “Lament for Pasiphae” to the playful “Mid-Winter Waking” and the dramatic “Intercession in Late October,” with its long poignant ending. The men and women of the chorus captured the shifting moods of the music with clarity and assurance, and with sensitive accompaniment from the orchestra. 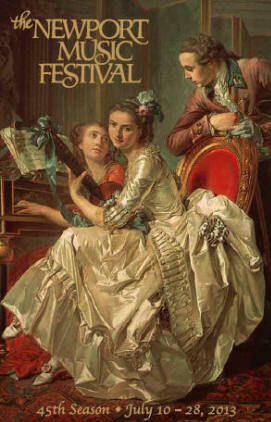 Two of the greatest works for chorus and orchestra by the English master Ralph Vaughan Williams completed the concert. He wrote the “Five Mystical Songs” to four poems by George Herbert (two songs are based on the same poem) for the Worcester Three Choirs Festival in 1911. Baritone Timothy Lefebvre was a mellifluous soloist, and the chorus was especially moving in its wordless passages during the sublime central song, “Love Bade Me Welcome.” The orchestral playing throughout this radiant cycle was suitably rapturous. Closing the program after intermission was the cantata “Dona Nobis Pacem,” written in 1937 to biblical texts and Civil War poems by Walt Whitman for the Huddersfield Choral Society as a plea by Vaughan Williams for peace in a world increasingly threatened by war. Chorus and orchestra were joined by baritone Lefebvre and soprano Sun Young Chang for a viscerally exciting performance. Two among many vocal highlights were: Lefebvre’s tender singing of the words “my enemy is dead, a man as divine as myself” in Whitman’s poem “Reconciliation;” and Chang’s recurrent and heartrending cries of “Dona nobis pacem,” especially when echoed by the chorus at the hushed close. How did they do that? 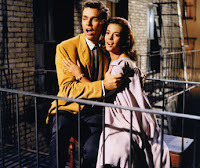 How did the Boston Symphony Orchestra (BSO) and its conductor David Newman recreate the entire score to the Academy Award winning movie musical “West Side Story” simultaneously with the singing and dialogue on screen? Didn’t the movie already have a sound track? Didn’t the actors/singers’ voices meld with the music? Yes and yes. However, today’s electronics and masterful techies designed means to lift the singing from the movie and, using layman’s terms, permit the BSO to perform as if it was the original composition of a half-century ago. The debut of “West Side Story” was 1963. Oftentimes, the police on “Law & Order,” “CSI,” et al will ask the brilliant computer guy/gal to isolate the background sound (ah ha, I hear a train whistle) or increase the pitch and machination of the person talking (ah ha, sounds like our killer). Perhaps this isn’t exactly the way that the BSO managed the monumentally creative task of playing “pit band” to “West Side Story,” but the process was similar. Tanglewood’s program book gives the details about “recognizing and removing orchestral elements on the sound track while retaining vocals, dialogue, and effects.” The program continues to describe the arduous work to synchronize the music with the action, the singers and the dancers in the movie. The shed was completely sold out, and the lawn “seats” just about full. The off and on rain of the day stopped an hour prior to the first downbeat, and the 90 degree day cooled to a 75 degree dusk and evening. Large movie screens were set in the shed and along the outside. In other words, the view was perfect for all. Hopefully, Tanglewood will program similar events like the coupling of the BSO with “WSS” to astound its audiences with other successes like this perfect evening of movie music. One of the somewhat hidden gems in the Berkshires is the annual play at Ventfort Hall. Each summer’s performance stars a solo female actor in the role of an historic figure related to Ventfort’s history. Subtitled, “The Geisha of the Gilden Age,” the story is the biography of Yuki Kato, wife of George Morgan of the famous J.P. Morgan family. George’s parents were owners of Ventfort Hall in the 1900’s. Mayu Iwasaki is beautiful and splendid in the role of the Japanese geisha whose life changes dramatically upon her marriage and life in the United States. It is, obviously, difficult for one person to hold an entire play together. Iwasaki, along with director Enrico Spada, flows smoothly from scene to scene just as her costume flows onstage. Iwasaki tells her audience Kato’s story in the first person – a story that isn’t always pretty, yet honest. As Ventfort Hall’s renovations continue, the staff increasingly adds public programs and events. In addition to theatre is a unique fashion doll exhibit, lectures, Appraisal Day, and the Tea & Talk Summer Series. The latter features noted experts speaking on such subjects as the Jekyl Island Club, the New York Subway tunnel art, Louisa May Alcott, Nellie Bly, and Miles Morgan. Talks are on Tuesdays from 4pm – 6pm. America’s long-term love affair with Dolly Gallagher Levi was officially launched in 1963 with the arrival of “Hello, Dolly!” on Broadway with the incredible Carol Channing as Dolly. At Goodspeed Opera House, Klea Blackhurst brings her own brand of charm, exuberance, and show-stopping delivery to a Dolly that has the audience cheering at frequent intervals. Blackhurst’s Dolly has captured the heart of the character and deserves to be ranked up at the top of the list of exceptional Dolly interpretations. She is extraordinary! 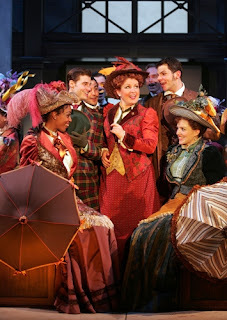 Goodspeed’s production of “Hello Dolly” has been handsomely produced by Michael Price, with flawless direction by Daniel Goldstein. The choreography of Kelli Barclay is miraculous. Her dancers are seldom given breathing space, spending most of the evening airborne. In the "Waiters Gallop" they are magnificent. As Horace Vandergelder, Tony Sheldon has totally absorbed he character down to the last double take. It would be difficult, if not impossible, to find a more captivating Irene Malloy than is portrayed by Ashley Brown. She is pure joy, as is Catherine Blades as her assistant, Minnie Fay. Spencer Moses as Cornelius Hackl, Mr. Vandergelder's Chief Clark, and Jeremy Morse, as Assistant Clerk Barnaby Tucker, are superb. Their frantically executed romp in the hat shop is a masterpiece of choreographic execution and timing, quickly followed by the inspired hilarity of “Dancing.” Jack Doyle deserves special credit for his excellent dual role performances as the Judge and especially as head waiter Rudolph Reisenweber. Creating the foundation for these marvelously endearing characters is the book by Michael Stewart, based on Thornton Wilder’s original play “The Matchmaker.” The score by Jerry Herman, who contributed both music and lyrics, is one of his best, filled with a series of show-stopping solos, duets, quartets, and full company ensemble numbers. It is a pleasure to hear such glorious, infectious music from a Broadway show performed with such enthusiasm and professionalism. As is customary at Goodspeed, everything that could possibly be done to create a memorable afternoon or evening at the theatre has been accomplished to perfection. “Hello, Dolly!” is another treasure of America’s glorious musical theatre past impeccably restored to vibrant life.